We are in store for another super moon which turns full today in the sign of Pisces. Think of all the dreamy, creative, imaginative Piscean traits and then multiply them as the full moon works its magic on your unconscious to bring things to the surface. This is not the day to be fighting what you don’t want to be brought to the surface. If you do so you may find that you are so caught up in trying to run away from that which you cannot escape that you inadvertently force your unconscious to push harder to make known to you what you need to deal with. Of course you could go down the route of having a few drinks to dampen the highly sensitive nature of this full moon but this may be the worst thing you can do as then you may find yourself spiralling further out of control and making any situation you were trying to avoid that much worse. This is a day to meditate and with this in mind you need to know what you want in order to give your meditations that extra push because the super moon will be adding weight to any dream you wish to take forward and also allowing you to explore different ways you can achieve this dream. 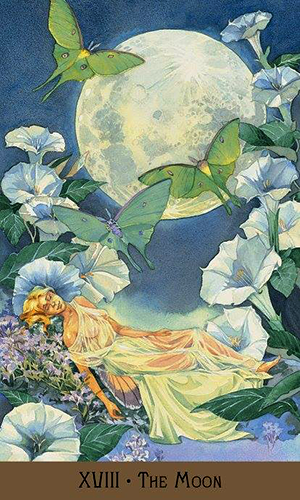 As you look at this image you see the figure in it peacefully asleep, resting in a dreamlike state, surrounded by bella donna flowers and luna moths. As she breaths in the aroma of the bella donna it takes her further into the depths of her imagination and the luna moths soar towards the full moon giving power to her thoughts and dreams to bring them to reality. Today’s tarotscope — The Moon — featuring the The Victorian Fairy Tarot by Gary Lippincott and Lunaea Weatherstone. Gary is a prolific fantasy artist and illustrator whose work is well known throughout the publishing industry. His children’s books are well worth checking out. Private commissions and individual prints are available for purchase on his website. Lunaea is the author behind the Mystical Cats Tarot, The Astrological Oracle Cards and Wicca Oracle, among others.